Wow! My first ever blog award. A mahossive thank you to Samantha it's so lovely to be getting an award because recently my blog has been a bit neglected but now I am getting back on track with it all! 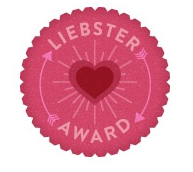 Liebster in German means sweetest, kindest, nicest, dearest, beloved, lovely, kind, pleasant, valued, cute, endearing and welcome, so it's super awesome to be getting this award! I think I have to tell you 11 facts about me then nominate some blogs so it should be easy...... hopefully! 1) I love going to the cinema, when I have the money and time though! 2) My top films are Paranormal Activity, The Dark Knight Rises, Harry Potter and One Day. They're all so different to each other! 3) I'm a bit of a geek. I'm always reading some sort of book, at the moment it's Enduring Love by Ian McEwan, it's about this guy who is stalked by this other guy who thinks they're in love. Strange I know but it's for my English A-level next year. 4) I'm studying English Literature, Media Studies, History and Economics and they're all a pain in the arse to study but hey-ho! 5) I want to become a journalist and write for a newspaper, magazine or anyone who basically wants me! 6) Music is another love. My secret indulgence is Take That, I've seen them 3 times so far! 7) Me and my family go to watch shows in London, a lot! Best so far is Wicked and Phantom of the Opera. 8) I enjoy travelling to new places, just not the actual plane or car part, it's so boring! 9) I have 5 chickens. Henrieta, Blanche, Araminta, Persephone and Baby Sparkle, they're all a bit crazy but they're great to have! 10) I also have cats, Charlie and Preston. Charlie is my best friend, despite leaving hair and dirt everywhere, he's my fat cat and I couldn't live without him! Phew! It's actually quite difficult to think of those, I hope they're not too boring for you guys! Sarah fashion blogs are one of my favourite! Sarah's finds from the highstreet are so awesome and her lovely messages just bring it all together. Beth is always up to date on the new styles whether it be in beauty or fashion and gives me great tips when painting my nails in particular. Lizzie has such a pretty blog! I love going on to it and finding new crafty bits and bobs to do. Helen's blog is one of the best for new nail polish styles as she has a never ending collection. Kath has such a quirky style and I really enjoy reading her blog to find out what new style she's got this week! Kylie her celebirty style steal is one of my must reads everytime! Such a brilliant blog. I'd definately check out all these blogs because they're all so great and are top favourites to read! Thanks again to Samantha and thank you for reading this!